The beauty of food growing in schools is that it is an activity all pupils can engage in and benefit from. One school for pupils with a range of special educational needs is proving just that. Many pupils at Charlton Park Academy had limited access to outside space and little understanding of where food comes from. Bryher Pennells, Culture Curriculum Lead, decided to introduce food growing to the school. They used raised beds and trugs enabling access for all pupils including those in wheelchairs. Plants are chosen for different reasons; fruit trees and hanging baskets entice pupils to look up, and herbs are great for the sensory gardens encouraging touch, taste and smell. Pupils benefit in lots of different ways too, some trying food they wouldn’t normally eat and others expanding their learning through photography and cooking. The post-16 student enterprise which uses produce from the garden to make food to sell and share is helping some pupils develop transferable skills for life. We have blogged about lack of space being one of the main barriers schools face when starting on their food growing journey, but lack of materials and resources was also a challenge mentioned in our schools survey. Setting up a new garden area doesn’t need to cost a fortune and the benefits of food growing are clear. Charlton Park Academy pupils started with just a couple of grow bags to try some easy crops, and trug buckets which can be easily moved around. Rhyl Primary School applied for a small grant to get them started with two raised beds in the school car park, but they also do a lot of their growing in containers. Outdoor Learning and Food Education Lead, Tom Moggach, believes a school garden doesn’t need to cost much to set up and that any spare resources should instead be focused on embedding food growing across the school to maximize the impact. Assess what you already have in school, and what you can re-use or re-purpose – you’ll be surprised what you can grow in, from old wellies to large tubs from the school caterers. Ask parents and the local community to sponsor specific elements of your garden, so they know what they’re buying with their donation – a fruit tree, a raised bed or even a poly-tunnel! The hats and gloves have been packed away and the sun has been making an appearance across the country. With the warmer and lighter days comes the opportunity to pull on your wellies and start growing food at your school this year. We know it might seem a bit daunting at first so we have put together a series of blogs to help you spring over the hurdles and get started. Our schools survey showed that around 30% of schools consider lack of space to be one of the biggest hurdles to food growing that they face. So, first things first – where can we grow? If you happen to have a nice sunny spot on your school playing field then great, start digging! But if not, don’t give up. Lots of food can be grown in containers of all shapes and sizes on the ground, on windowsills or hanging down. John Ruskin Primary School in Southwark have limited outdoor space so all of their growing is in trugs and raised beds built on the playground, and with help from Walworth Garden Farm, they have also started growing food on the roof of the school. They have lost a bit of playground area but the children play around the beds which makes the space more dynamic. Now they’re thinking of how to make opportunities to grow upwards, using archways and trellis to get the most out of every square foot. Suzy Gregory, Co-Deputy Headteacher suggests getting a planter as big as you can afford, and just start growing. Plant something easy like lettuce, potatoes or tomatoes and give it a grow! ‘Lack of time in the curriculum’ came in the top three of barriers to food growing faced by schools in our schools survey. Schools have to achieve so much but instead of being an add-on, food growing can actually help to deliver the curriculum and has been known to increase attainment levels too. Growing a few spuds or some tomatoes is fun and relatively easy, but it’s when food growing is linked to the curriculum, and ideally across the whole school, that the real magic happens. At Charlton Manor Primary food growing is incorporated across all subjects and lessons are planned with a gardener and chef to revolve around the garden. Headteacher Tim Baker is convinced this ‘learning through doing’ approach has helped children to make sense of the curriculum as well as encouraging them to lead healthier lives. The school has reported better concentration and behaviour, and increases in attendance and attainment as a result of their whole school approach to food growing. It’s not just the obvious subjects. FGSL partner Trees for Cities surveyed the 50 schools they have helped and while all Headteachers said that they used their edible playgrounds for Maths and Science lessons, schools were using the garden for other subjects too. English and Art were high on the list with 92%, followed by Design and Technology (76%), Geography (30%), Languages (23%), RE and ICT (15%) and History (7%). Chisenhale School has made their garden a learning place for the whole school with classes across all subjects being held in their outdoor classroom. 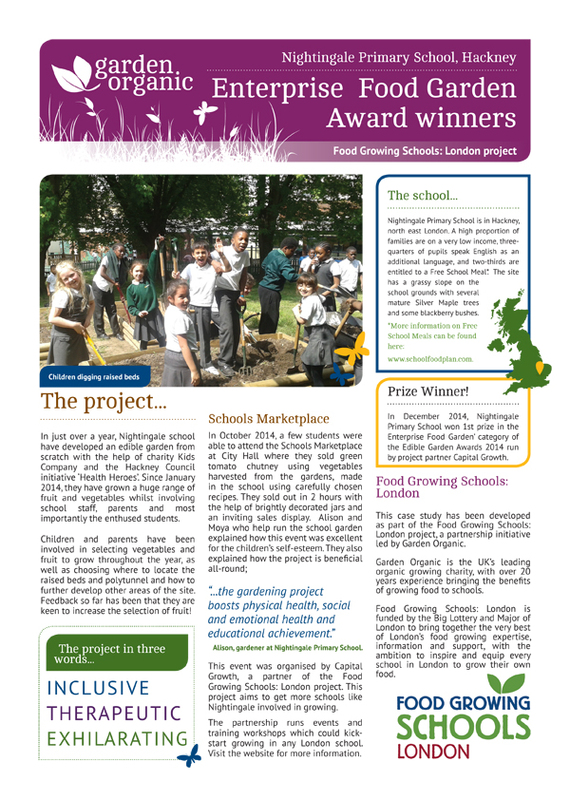 Children have also sold the produce, linking food growing to curriculum areas like marketing and enterprise. Parent gardener Cassie Liversidge has seen children who struggle to concentrate in the classroom, building confidence and skills through the garden. Build support for food growing with teachers and the management team – share FGSL research on the benefits of food growing. Take advantage of the huge amount of free resources available online to help link food growing to the curriculum. Start with the Termly Packs from FGSL and growing resources from FGSL Partners including these from the RHS Campaign for School Gardening.